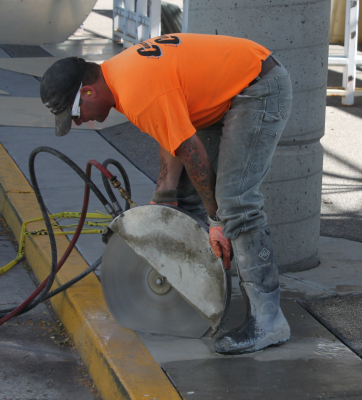 Concrete Cutters Inc. can perform this service on concrete, brick, asphalt, and rock. We can cut on walls, floors, or most any hard surfaces. Concrete Cutters Inc. has the capability to cut up to 30" deep from one side. We use hydraulic and electric powered wall saws making it possible to cut deep inside enclosed areas such as hospitals and schools with no worries from exhaust emissions. With the electric powered saw we can also cut in more dangerous situations with out the danger due to the fact it is run off of remote control making it so our men can work from a safe distance. Concrete Cutters Inc. can perform this service on concrete, asphalt, rock, and brick. Our saws include 480 electric for inside cutting, no emissions, Gas 60hp, diesel saw great for deep sawing, and propane. The bulk of our slab sawing is done on the streets cutting out large sections of concrete and asphalt for new or old utilities. We also have a big market cutting inside concrete floors to make room for new or existing plumbing and electrical. Our inside 480 electric saw is a very good fit for this with its no emissions motor. keeping our employees and others around safe. 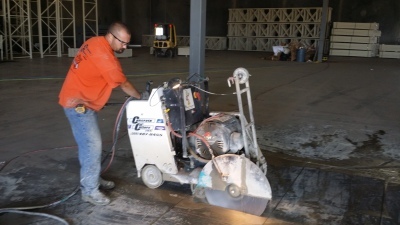 Concrete Cutters Inc. can perform this service on concrete, asphalt, brick and rock. We use hydraulic 20" diamond blade saws, capable of cutting up to 8" deep from one side. These saws are great for cutting inside floors where we cant get our bigger slabs saws, such as basements and tight spaces like bathrooms. We also use them to cut on walls to create small openings for air ducting, crawlspace accesses. We only use a hand saw when the wall saw or slab saw cant be used due to size or access. The hand saw is a very versatile tool but it does not run on a track and its hand held making it a bit less accurate and more straining on our employees.